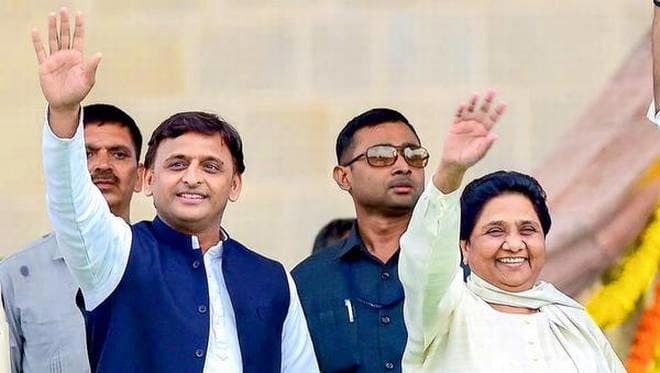 Finally, Mayawati, the Chief of the Bahujan Samaj Party(BSP) struck an alliance with Samajwadi Party (SP) and amicably sorted out the sharing of seats for the forthcoming 2019 Lok Sabha Elections. Recently, advice by Ram Das Athawale of Republican Party of India, currently sitting in the lap of Manuwadi, anti-Dalit Party, to Mayawati to join the BJP than the SP seems absurd and illogical. The Dalit leaders like Ram Das Athawale, Ram Vilas Paswan, Udit Raj are sitting in the lap of the BJP pushing the agenda of the BJP thereby threatening the social, economic and political prospects of the Dalits. Since 2014 the trios found indulged in fulfilling the economic and political aspirations of the Brahmin Communities rather than the Dalit communities. However, they are Dalit leaders for name-sake but wholeheartedly work for the upliftment and advancement of the Brahmin communities. Ram Vilas Paswan has been instrumental in demanding reservation for the economically Other Backward Classes(OBCs) and finally, the BJP succeeded in winning the favour of all political parties to get the reservation bill passed in both the houses of the Parliament without wasting further time. The swift action on the part of BJP is wanting to win votes for the forthcoming Lok Sabha Elections in 2019 keeping in mind the OBCs votes especially in Uttar Pradesh(UP). After winning Phulpur & Kairana bypoll elections in UP, the confidence level of BSP-SP bourgeoned since both the heads of the political parties came to understand that the BJP can be defeated only by joining hands together. This political strategy worked in favor of the alliance. So it is good that Mayawati and Akhilesh Yadav came together to take on Mr. Modi and RSS. Several empirical surveys show that Yadavs and Dalits suffer the same problem of economic backwardness in UP as they suffer in other states currently ruled by the BJP. During 2014 elections, the BJP on the shoulders of Mr. Narendra Modi succeeded in splitting votes but both the communities got nothing except JUMLEBAJI. Similarly, Muslims are pushed to the brink of social and political seclusion by the BJP in the country especially in UP. The recommendation of Sachar Committee report is never looked into by the BJP to ameliorate economic backwardness of the Muslims. Christians in the state of Uttar Pradesh have thin population yet the members of the community are insulted, beaten, and tortured. Not only this, Christian churches are desecrated and demolished by the BJP/RSS/VHP combine across the country. Mayawati and Akhilesh Yadav need to convince the desperate members of these minority communities that they are safe and secure only under the rule of the alliance. Both the party leaders need to bridge the barriers between the Yadavs and the Dalits to consolidate the votes. On the other hand, to counter the sinister propaganda based on caste lines, the alliance has to take the help of electronic media to spread positive narrative about both the parties and leaders. Mayawati has been out of power since 2012. According to political pundits, this absenteeism is considered a long period in the political realm for a leader to survive politically. There are many factors which would create hurdles in the path of victory for Mayawati. The main hurdle is the BJP, the master of lies, manoeuvers, intrigues, and horse-trading has been vehemently spreading among the Yadav and Dalit voters that Mayawati became three times Chief Minister in the state of Uttar Pradesh on the support of the BJP. Another argument is spread that Mayawati is no longer a leader of the poor, backward, secluded Dalits but of the Brahmins. Both these arguments are true to a larger extent. On the other hand, the BJP has been in the process of identifying disgruntled BSP leaders across the country to position them in Uttar Pradesh to spread rumors and lies against Mayawati. Fake news and misinformation to split Dalit votes is a powerful tool in the hands of the BJP/RSS. It is observed that the authors, writers are hired by the BJP to contribute the articles to be depicted Mayawati as bourgeois women. The role of the Congress will be to take advantage of the split votes. Priyanka Gandhi is going to take the lead to split the votes on several issues such as mis-governance of Modi government, social and economic backwardness of both the communities. Her role is limited to create confusion among the voters of UP. During 2014 elections such strategy undertaken by the BJP worked in splitting the Dalit vote bank. Simply winning UP is not going to fulfill the aspirations of the BSP leaders and workers to make Mayawati- Prime Minister of India. In the contemporary scenario, Mayawati needs to bring in educated people on the board to spread a positive narrative in India about the BSP. The Brahmin faces of Satish Mishra and Sudhindra Bhadoria are irritating the intelligent Dalits since the educated Dalits feels alienated by Mayawati in the larger context. Alienation of Dalit intellectual class may prove to be problematic for the BSP in the long run. It is unfortunate that the leaders appointed by Mayawati hardly noticed working collectively to promote the political agenda of the party but checkmate one another. During the birth celebration of Mayawati, the leaders of the BSP observed talking about their personal agenda not the accomplishments of Mayawati and the BSP. After the alliance between BSP-SP chances are bright for Mayawati to save her diminishing political career but this could be possible only if Mayawati set her house in order first and later intensify grassroots level political activities in the state of Uttar Pradesh. Mayawati needs to be cautious while striking an alliance in any other state which is going to affect badly the political prospects of the BSP. For example in Punjab, Mayawati permitted the local leadership to shake hands with the disgruntled AAP leaders like Sukhpal Khaira of Punjab Democratic Alliance (PDA). Voters especially the Dalits are skeptical about this alliance. Such untrustworthy and undependable alliance is likely to cause formidable damage to the BSP in the state of Punjab. Internally, as a Chief of the BSP, the weak link between the BSP leaders and workers need to be bridged. Communication between the local leaders and workers needs to accelerate since the time is running out to defeat the BJP. Disclaimer: Opinions expressed are solely my personal and do not express the views of the Party.